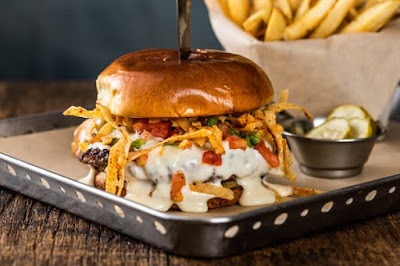 Chili's adds to their burger selection with the introduction of the new Queso Burger. They also welcome new Mushroom Jack Chicken Fajitas to the menu. The new burger features a half-pound patty smothered in white queso and topped with crunchy tortilla strips and pico de gallo on a toasted brioche bun. Mushroom Jack Chicken Fajitas consists of grilled chicken, sauteed mushrooms, crumbled bacon, and mixed cheese cooked with chipotle butter, bell peppers, and onions and sprinkled with cilantro. The sizzling plate comes served with Mexican rice, black beans, guacamole, sour cream, pico de gallo, salsa, shredded cheese, and a choice of flour or corn tortillas. For those looking for a deal, both entrees join the entree choices for Chili's 3 for $10 special, where you can get an entree, an appetizer, and a non-alcoholic drink from a limited selection (which varies with location) for $10.